Tinder, the online dating app, has exploded in popularity precisely because of its bare-bones simplicity. There’s purposefully no profiles to fill out, and Tinder’s creators say its superficial focus on looks mimics the social dynamics of the offline world. All members see about potential dates are a few photos, mutual friends and interests, and the other person’s location. But given how little there is to go by, do people really meet up with strangers they find on Tinder -- with no friends in common, zero personal information and an unusually pretty face? Are a few cute photos and an invitation enough to lure people on a date? Emphatically, yes. And more than five dozen people, at that. Intrigued by Tinder’s success on their college’s campus, three Brigham Young University college students set up a social media experiment to test how many men would show up at a frozen yogurt shop to meet a pretty girl they’d found on Tinder, but knew nothing about. “We were looking at it the other night and wondered, ‘how many guys would actually randomly meet up with someone they’d never talked to in real life or anything?’” said Bowman Bagley, a junior who organized the Tinder test with roommates Danny Gessel and Joshua Valdez. “We weren’t sure we’d be willing to do it … We didn’t think that many people would. And we were proven wrong." Since Tinder requires a Facebook account to log in -- a measure meant to weed out precisely the kind of fake accounts the roommates created -- Bagley and his friends set up a Facebook profile for a fictional, 21-year-old girl they dubbed “Sammy.” They uploaded a handful of photos taken from Miss Teen USA Kendall Fein’s online profile, signed into Tinder and, on Wednesday at around 9 p.m., spent an hour “liking” every guy that appeared. Tinder online allows two users to message each other if both have “liked” each other. Soon, Sammy had amassed about 250 matches, meaning several hundred people had “liked” her back. And the following day, the roommates messaged each guy, inviting him to meet Sammy at a local frozen yogurt shop in Orem, Utah. “I’m going to yogurt shop called yogurtland tonight at 9 in orem with some girl friends if you want to meet up ;) [sic]” Sammy wrote. Bagley figured it’d be a bust. “We thought maybe five people would show up because it’s kind of sketchy to have just a random person you’ve never met send you this one message,” he explained. He estimates that more than 70 men showed up at Yogurtland. “It blew my mind,” he added. On the blog A Little Bit of Lizzy, an onlooker described a similar scene. The fake Sammy wasn’t a particularly sophisticated fake: The dream girl had just four photos, but no friends, no personal details and no interest in learning more about her matches. “Her” first message to her matches had been her invitation to meet in person. Her primary Tinder photo, visible here, would also seem suspiciously perfect. What makes the success of the experiment even more impressive is that Tinder’s demographic is theoretically a web-savvy one, used to negotiating the social web. According to Tinder co-founder Justin Mateen, more than 70 percent of Tinder’s users are between 18 and 24 years old, and 20 percent are between 25 and 34. In an interview earlier this month, Mateen said Tinder hadn’t had problems with fake or spam accounts. Before the Brigham Young roommates erased Sammy’s profile on Friday, they’d received a flood of messages from guys who’d either missed the Yogurtland meet-up -- and wanted to see if she was free on Saturday -- or had been stood up. “So, missed ya at the thing tonight,” wrote another. “social media experiment,” Sammy answered, “her” standard reply. Bagley, for his part, recently deleted his Tinder profile, just three weeks after setting it up. Apple fans rejoice! 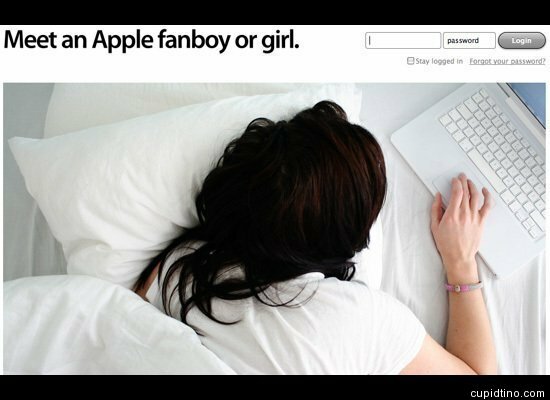 "Mac-inspired" <a href="http://cupidtino.com/" target="_hplink">Cupidtino</a> will connect members with the Apple fanboys (or fangirls) of their dreams.